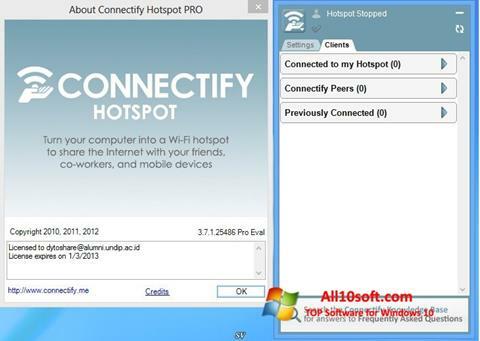 Connectify for Windows 10 - software that can eliminate the need to purchase a Wi-Fi router. Using this product, you can create an access point to a wireless network based on a PC or laptop that has a network adapter. Mobile, portable devices can be connected to the network created in this way. To master, use this application is not difficult thanks to a simple, intuitive interface. All that is required to get started is to set up a connection, specify a username and password. It is possible to view statistics, the management of connected devices is available. Minimizes to system tray. You can free download Connectify official latest version for Windows 10 in English.